When you’re looking into how to create a website, one service that will tend to crop up again and again is WordPress. There’s a reason for this-with its high level of customization, large selection of themes, and enough widgets and tools for even the most complicated of websites, it’s the natural choice for tech savvy people who want to better reach their audience on the cheap. With that said, we’re going to look into some of the best ways that you can go about designing a successful WordPress site. Let’s get started with the domain that you’re going to choose. Obviously, without a domain your users won’t be able to find you on the web. But you shouldn’t jump at the first thing that comes to mind–you’ll want to take some time to consider the best domain for you, one that represents your brand well while being highly searchable and memorable. But along with choosing your root domain (the “facebook” in “facebook.com”), you’re also going to want to put some thought into your top-level domain. You might automatically jump to .com for this, but you have plenty of other choices too, such as .gov, .edu, or .net. Choose the domain that’s right for you. When it comes to choosing the right host, you’re obviously going to want to choose one that helps you instead of hinders you. As an example, there are some hosts out there that only allow for one domain, so if you were thinking of having multiple websites you’d be out of luck. In terms of limitations, you’re definitely going to want to make sure that the host supports WordPress, you’ll be looking at how many domains you’re allowed to host, and how much bandwidth you’re given. You’re going to want to check how long this company has been in business, as well as their user reviews. You’re going to want to know how much the package is, if there are any upgrades available, and if there’s a free trial option to take advantage of. Once you’ve gone ahead and taken care of the essentials like configuring the nameservers, uploading WordPress, creating a database, modifying the configuration, and actually installing WordPress, you’re going to have to take the next step in the process and choose a suitable theme. When it comes to picking a theme, your theme functions like the foundation of your house. There are thousands of free and premium themes out there, and you can also have one custom designed, although this is much more expensive to do. When you’re looking into how to create a website, finding the perfect theme can seem like the hardest thing in the world to do, but it doesn’t have to be. In order to weed out the undesirables, you’re going to want to ask some questions like if the theme meets all of your requirements, if it can be fully customized, if the color schemes match with your brand, and whether or not you’ll end up outgrowing this theme. Once you’ve gotten everything set up and picked out a theme, you’re going to need to get some basic configurations out of the way to really beef up your website. Among these, you’ll want to activate Akismet, which will help you to weed out and remove spam comments, ensuring that your site always looks professional. You’ll want to disable comments if need be, which can be decided on a post to post basis, you’ll want to configure your permalinks to make them more search engine friendly, and you’ll want to add a gravatar to really personalize your site and make it pop. While no website is ever going to be 100% secure, there are a few ways that you can make sure your site is as secure as you can make it, all with a few simple fixes. One way is to make sure WordPress is up to date, as future updates will find exploits and fix them automatically. You can change your database table’s prefix, which will make it much harder for potential hackers to search for the default prefix and hack into your mainframe as a result. On that note, you’re going to want to remove the version of WordPress you’re using from the website’s header, since showing that will allow hackers to figure out which exploits to use. Lastly, change that user name from admin to something more unique. If hackers can figure out that your username is just admin, they’ll be one step away from hacking your site by figuring out your password. When someone comes across your site, they’re going to want to be able to find essential info super fast. This is where setting up comprehensive and helpful essential pages comes in. This can include your home page, your about page, a page where people can contact you, and your basic type of “hire me” page. You can focus on all of the other specific details later, but until you’ve got these essential pieces in place you don’t have a truly functional website. 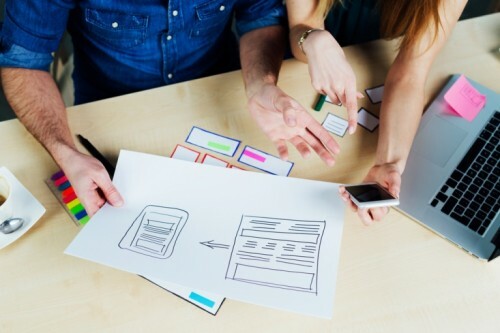 If you can really nail these aspect of the web design process, you’ll be looking at a site that will engage even passing visitors, and definitely draw people to your platform. While this list isn’t completely exhaustive, if you follow some of these simple ideas and even implement some of your own, you’ll be on your way to having a website that’ll really push your brand out there while engaging new visitors/potential clients. Once you’ve gotten the more technical aspects of the job out of the way, such as choosing a domain, a hosting package, and the like, you can focus on things like essential pages and themes to really make your site shine. So best of luck on your web design adventure, and remember–the most important thing is that you learn to adapt. What it Takes to Rank Locally and Organically?